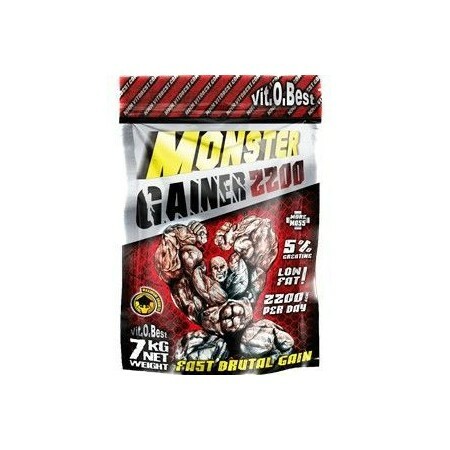 Vit.o.Best offers Monster Gainer 7 Kg 2200, a product that quickly propels the rapid and efficient growth of muscle mass. With a base of carbon and high-quality protein, the formula provides Vit.o.Best aims meet the different needs of elite athletes who train hard and fisiculturas. In nutrición24 offers on other nutritional supplements with which to combine Monster Gainer 2200 7 Kg. 7 Kg Monster Gainer 2200 is based on complex carbohydrates and simple carbohydrates (oats and dextrose) by which we can get a quick energy source and long lasting. Oatmeal has many qualities, so it is the carbohydrate favorite athletes practicing bodybuilding. Low glycemic index (GI) and rich in fiber, you will reach your goals easily diet and physical development. Dextrose consisting of Monster Gainer 2200 7 kg amino acids is one of the most glycemic insulinita causing a reaction effect which makes creatine accumulate inside the muscle. The result we get is a muscle cell growth and increase muscle mass. Dextrose is also recommended to channel creatine monohydrate to be more effective than other traditional components dextrose. With over 21% WPC (whey ultrafiltrate), proteins with many BCAAs (L-Glutamine, L-isoleucine and L-valine), Monster Gainer 2200 Vit.o.Best 7 Kg benefits creating muscle and it is free from fats. In addition, a large amount of L-glutamine from the essential branched chain amino acids help repair muscle fibers after intense exercise. When the body begins to manufacture of muscle mass is required when the BCAA's, especially when the body remade muscle protein that has been discarded during training. 5% ultra pure creatine monohydrate (Creapure®) is the perfect component Monster Gainer 2200 7 Kg, necessary to increase strength and endurance. The ultrapure creatine Vit.o.Best markets is the most innovative creatine market for its delicate manufacturing process in German laboratories and security that gives the brand Creapure®. We recommend taking 175 grams before and after training. You can also complement any meal with this supplement. Dextrose monohydrate crystal, brown oatmeal, instant protein concentrate whey obtained by ultramicrofiltration, aromas, cocoa (chocolate flavor), creatine monohydrate, sweetener (sucralose), dye E-102 (lemon flavor), red dye E-124 and natural coloring E-162 beet red (strawberry flavor).